Skyjack’s A-SERIES Articulating Boom has been engineered utilizing many of Skyjack’s robust and reliable design features. The A-SERIES boom lift is currently available as a 46AJ configuration with jib. The 46AJ boasts an industry leading, standard equipped, 360 degree continuous turret rotation. Zero tail swing compliments the turret design allowing for flexible operation in tight locations. Superior positive traction and terrain ability is provided by the axle based 4WD used in many of Skyjack’s product designs, which accounts for a proven low maintenance, rugged and reliable drive train. The AJ is equipped with a rear axle hydraulic differential lock/unlock switch allowing the operator to lock the rear differential when negotiating rough terrain. The unlocked position improves turning radius and reduces tire marks on hard surfaces. Other key features include; direction sensing drive and steer controls, true vertical rise with riser function which prevents drifting forward or backwards, analog based controls and Skyjack’s s.
Learn more about the Skyjack model SJ46AJ standard features below. 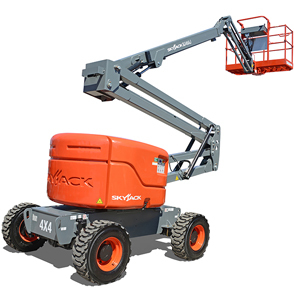 For more information about its rental prices go to our Skyjack Boom Lift SJ46AJ product page or call us at (813)971-9990.